Ethernet and IEEE 802.3 – Operate at 10 Mbps over coaxial cable, UTP, or fiber. 100 Mbps Ethernet (Fast Ethernet IEEE 802.3u) – Operates over UTP or fiber. 1000 Mbps Ethernet – Gigabit Ethernet that operates over fiber. Fast Ethernet can be used throughout the campus environment. The following table gives examples of each campus layer. The following table compares cable and connector specifications. 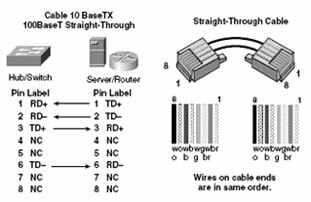 Fast Ethernet requires unshielded twisted-pair (UTP) Category 5 cabling. 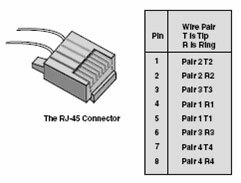 An RJ-45 connector is used with UTP cabling. The two types of connections are straight-through and crossover. Straight-through cables are typically used to connect different devices, such as switch-to router connections. Crossover cables are typically used to connect similar devices, such as switch to switch connections. The primary exception to this rule is switch-to-hub connections, which use a crossover cable. Some device ports are marked with an X. In general, use a straight-through cable when only one of the ports is marked. 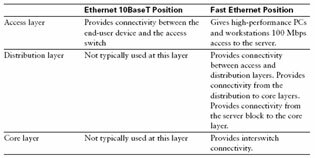 Ethernet has several LAN specifications, including IEEE 802.3 (10Mbps), IEEE 802.3u (100 Mbps), and Gigabit Ethernet (1000 Mbps). UTP Category 5 is required for Fast Ethernet. Straight-through cables are typically used to connect different device types, such as a router and a switch. The exception is a switch-to-hub connection, which requires a crossover cable. 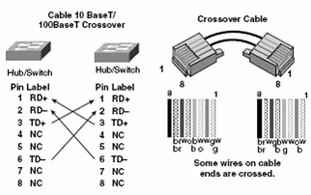 Crossover cables are typically used to connect similar devices, such as a switch and a switch. There are several ways to carry traffic across the WAN. The implementation depends on distance, speed, and the type of service required. The speeds of connections vary from 56 Kbps to T1/E1 (1.544/2.048 Mbps). WANs use serial communication for long distance communication. Cisco routers use a proprietary 60-pin connector. The network end of the cable must match the service hardware. DTE-The endpoint of the user’s device on the WAN link. DCE-The point where responsibility for delivery data passes into the hands of the SP. The DCE provides clocking and is responsible for forwarding traffic. If you connect routers back-to-back, one of the routers will be a DTE, and the other will be a DCE. Fixed ports-Each port has a port type and number (such as “Ethernet 0”). Modular ports-Each port has a port type, slot number, and port number (such as “serial 1/0”). 1 Cable the device using a rollover cable. You might need an adapter for the PC. 9600 bps, 8 data bits, no parity, 1 stop bit, and no flow control. WANs use serial transmission for long-distance communication. Cisco routers use a proprietary 60-pin connector on serial ports. A DTE/DCE is the point where the service provider assumes for the WAN. A DCE provides clocking. Routers have either fixed or modular ports. The syntax you use to configure each interface depends on the type of port. Rollover cables are used to set up a console connection.